The gargantuan star fort of the Imperial Fists, the Phalanx is to be the host for half a dozen Space Marine Chapters. Along with Inquisitors, Sisters of Battle and agents of the Adeptus Mechanicus they will witness a darkly historic event - the end of a Space Marine chapter. After the events of Hellforged and the betrayal of the Adeptus Mechanicus, the once noble Soul Drinkers, chaos-tainted renegades and heretics - have been captured, stripped of armour and weapons and will be put on trial for their crimes against the Imperium. First serialised in Hammer & Bolter, Phalanx is the epic conclusion to the long running Soul Drinkers series, a unique chapter of Space Marines who fought the Imperium and yet remained loyal to the Emperor. The series stands out as a dark, grim tale in an already grim universe but one that really does offer something quite different. Phalanx is a fitting end to the saga, written with consummate style and fantastic action sequences. 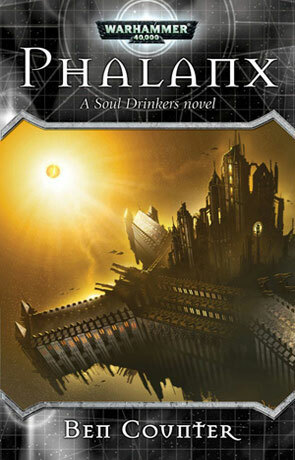 It is highly recommended that you read the rest of the series but anyone can pick this book up and still enjoy it without knowing the slightest bit about the Soul Drinkers, for those who have been following the saga the first half may seem a little slow as it summarises the events over the past six novels. To me though this works very well, the writing is crisp, the pace fast and the reflection works perfectly as testament to this unique chapter. To keep the knowledgeable reader entertained there is also quite a bit of extra detail and more than a few revelations about the Soul Drinkers that manage to add to the story very effectively. More importantly though the novel offers closure on the series and while those looking for a happy ending will be disappointed (come on this IS the Soul Drinkers we are talking about here) the conclusion is powerfully poignant and very memorable. The later half of the book also contains one of the most furious battles I have read in a long time with Space Marines from over a dozen different chapters pitched against a single enemy assaulting the behemoth Phalanx star fort. With a high body count, intense and gloriously detailed fighting and potentially cataclysmic consequences it rates as one fantastic fight. I can't think of a more deserving, more evocative or more fitting ending to the series, a memorable novel and a damn fine read. Written on 30th March 2012 by Ant.